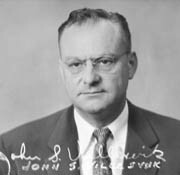 Born August 1, 1905 in Bagley, Minnesota, John Storm Villesvik attended grade school in Spokane, Washington before moving to Tacoma, where he graduated from Lincoln High School in 1923. His formal education was from the University of Washington (1924 to 1929) where he received his bachelor’s degree in Architecture in 1929. An excellent student, Villesvik was a member of the Tau Sigma Delta National Honorary Architectural Fraternity and received several scholarships and allocates for his design work. These included the Charles Bebb Prize (1925) and the Gladding McBean Prize. During the fall of 1928, Villesvik was also awarded the Walker Traveling Scholarship for architectural study in Europe and enrolled at the prestigious Fontainebleau School of Fine Arts (graduating in the summer of 1928). During school, Villesvik had gained valuable experience working as a bricklayer and carpenter in the summers. He also worked in a variety of architectural offices including J.L. McCauley; Naramore & Menke; W.J. Bain; Doyle & Merriam; Sherwood D. Ford; and Baker, Vogel & Roush. Upon his return to the states and graduation, he received his architectural license (No.L111) on Dec. 21, 1929 at the young age of twenty-four. Villesvik then went to work for Yakima architect John Maloney. As the most prominent architectural firm in town, he gained valuable experience and contact with Yakima’s elite. Quickly he rose up the ranks from draftsman to designer, then to job captain. In 1943, when Maloney opened up a second practice in Seattle, his business in the Yakima Valley started to wane. Villesvik, saw a need to have a locally dedicated architectural firm in Yakima and opened up his own independent practice in April of 1945. Having been the primary contact for the Maloney firm in Yakima for several years, Villesvik did not have any problems branching out on his own and/or finding work. By the mid 1950s the practice had grown to six employees. One of the most important employees was Maurice R. Smith, who joined the firm in 1946, became an Associate in 1957, and eventually partner in 1962. In time, Smith bought out the firm when Villesvik retired in 1972. From 1947 to 1957 the firm produced $10.5 million dollars in projects. In 1957 alone the firm had over 2.6 million dollars worth of projects in the planning stages. The work of the firm ranged from residential to commercial, but included many civic structures, institutional buildings and a variety of churches. Notable projects included the Main Yakima Library (1959); the Yakima County Courthouse addition (1962); the Yakima Valley Museum (1958); several elementary schools for the Yakima School District (1955-56); and Saint Timothy’s Episcopal Church (1957). Many of their residential commissions were for professional clients including homes for Dr. Herr (1947); Dr. Low (1947); and Harold Cahoon (1950) owner of Cahoon Motors. While formally trained in the Beaux Arts tradition, Villesvik’s designs increasingly shifted to newer designs philosophies as exposed by the Bauhaus. Flat roofs, curtain walls, modern fixtures, open space planning and an idea the “form follows function” are all evident is his post 1950 designs. Among his more notable modern area residential designs are the Dr. C.I. Hood House (1951). The Hood House, now altered featured a distinct International Style profile complete with a flat roof and bandings of windows. Villesvik work was published in a variety of magazines including articles in the 1952 and 53 issues of Construction News Bulletin and the 1951 issue of Church Property Administration. Displays of work at School Planning Conference, National Convention American Association of School Administrators, International Conference of Public Education in Switzerland (1957). In 1957 he received his NCARB accreditation (No. 5669). Villesvik retired in 1972, and sold his practice. He passed away on July 16, 1993 in Phoenix, Arizona.